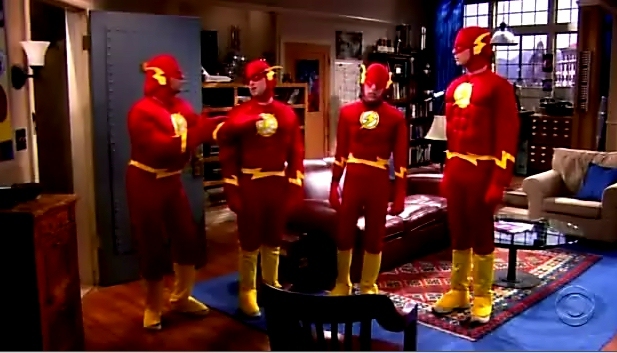 The Big Bang Theory gang - should have had a costume meeting! Dressing up as your favourite comic book/TV show hero or heroine is almost a “must”. Someone said to me that you’re not serious about Comic-Con unless you dress up. So if you bump into another Harry Potter or The Flash, you are absolutely in the right place. If you are not dressed up as someone from Stargate then you can probably expect a few awkward stares. Given the numerous Star Trek movies that have been released over the years, I’m not sure if it is still considered a good costume or not if you turn up as Spock but I do know the original Captain Kirk himself, William Shatner, will be at SDCC. Film distributors use the convention as one of their many marketing platforms to promote upcoming action blockbusters such as The Avengers franchise (Iron Man, Thor, Captain America, etc) and Twilight. 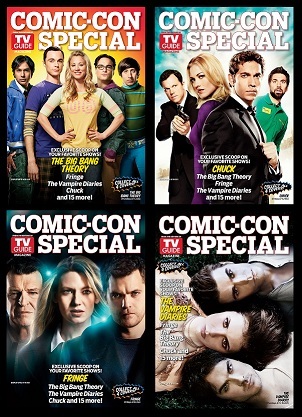 Television networks also love SDCC and it would seem your show doesn’t have to have anything to do with comics or sci-fi – if your characters are comic geeks then you can expect them to be well represented in San Diego as well (eg NBCU’s Chuck and USA Network’s Psych). But even if your show has nothing to do with comics or science fiction, you might find yourself in one of the many big halls for a panel appearance. Based on tweets and web reports from the 2010 SDCC, it looked like the some of the most popular panels featured stars from shows on the USA Network. Psych had a surprise guest in the form of Curt Smith (yes, he’s one half of the 80s duo Tears for Fears) who had appeared on the show and of course, my favourite show, White Collar, whose panel was crashed by rival showrunner of Burn Notice, Matt Nix, challenging the writers of White Collar to a paintball war with the writers of Burn Notice. But what was probably one of the funniest moments of the SDCC for the non-geeks like myself, happened at the booths when the two stars of White Collar, Matt Bomer and Tim DeKay, took to the dance floor at the Wii booth by having a dance-off! Even if you are not a fan of the show (why not? just kidding…not really :)) I’m sure you would find this quite hilarious. Nice post! I went to SDCC last year for the first time and it was crazy but fun. Spent all day Thurs in ballroom 20 for several panels (after waiting in line for 5 hours to get into ballroom 20): Burn Notice, White Collar, Psych, and Dexter. But you’re dead on about the lack of sleep and 5 to 6 hours of lines at 4 am. Such a crazy experience. I started crying watching your post of Zachary Levi’s tearful farewell at the end of the panel! I’m really going to miss the silliness of the show when it’s all over! Hope he’s got some new projects at hand when it’s all over. Certainly the Nerd Machine looks to be an awesome business adventure for him. Wasn’t it beautiful?! I was crying too hahahaha. I asked them at the signing what they have planned after Chuck. But no one would tell me. Josh said he’s just hoping to get a job hahaha.